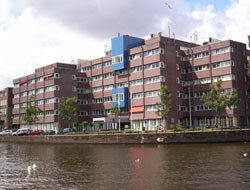 Small in area and densely populated, De Baarsjes is right next to the city’s ring road. De Baarsjes has one of the most diverse populations in the Netherlands. Foreign-born residents make up about half the population, and come from more than 100 countries. De Baarsjes tends to the average: average income, crime rate (low), residential prices and house sizes. De Baarsjes is divided into five small neighbourhoods and does not have a business district or any significant parks, though Erasmus Park in Bos en Lommer is nearby. There are several high schools in the area, many of which cater to the children of foreign-born residents.